The investment grade credit markets closed at YTD tights on Thursday evening, riding a wave of strong sentiment from a surprisingly dovish Fed statement on Wednesday. The story changed on Friday, however, with a decidedly softer tone fueled by concerns about the lack of growth globally. Credit is mixed as we go to print on Friday with major stock indices firmly in the red on the day. The 10yr Treasury will finish the week almost 10 basis points lower than where it started, which will likely mark a YTD low for the benchmark rate. After peaking at 3.24% in November of 2018, the 10yr has now completely retraced its steps to 2.43%, which is almost exactly where it opened in 2018. The extreme volatility that we have seen in rates over the past six months offers us a reminder of just how difficult it can be to accurately predict interest rate moves and this unpredictability is the reason that we at CAM focus on credit risk and the intermediate portion of the yield curve as opposed to trying to predict where rates will go next by making duration bets. It was another solid week of issuance for corporate bowers, as companies brought $21.55bln in new corporate debt during the week. $88.125bln of debt has been priced in the month of March and the year-to-date tally of new issuance is $292.298bln according to data compiled by Bloomberg. 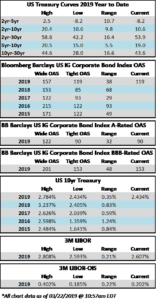 The pace of 2019 IG issuance is trailing 2018 by 9%. According to Wells Fargo, IG fund flows during the week of March 14-March 20 were +$4.5 billion. This brings YTD IG fund flows to +$62.222bln. 2019 flows to this juncture are up 2.43% relative to 2018.